Xmas Lights – Fix ‘Em Up! This month we released a brand new game! 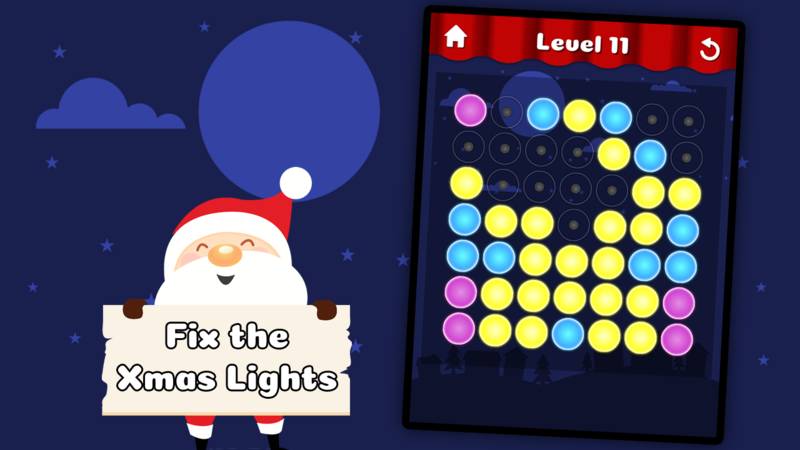 Xmas Lights is a puzzle game where you have to save Christmas by repairing faulty fairy lights. Solving each puzzle reveals a cute little Christmas pattern, with 120 to discover in total. You can download the game for free on Android, iOS and Windows. As usual we’ve been plugging away designing new fonts for use in your creative projects. This month we managed to release 22 of them, and here they are! Finally, towards the end of November, GamesIndustry.biz ran an article arranged by YoYo Games on the future of 2D gaming. Our own Dan Johnston was invited to share some opinions alongside a range of experienced game developers on 2D games and the comeback they have made over the last few years. It’s an interesting read if you enjoy the ins and outs of game development! And that’s all for now, we’ll take this opportunity to wish you a Merry Christmas and a Happy New Year!